1976 Denver, screen-printed, fold-over tab. Price: Please email me if you have this pin to trade or sell. Thank you. 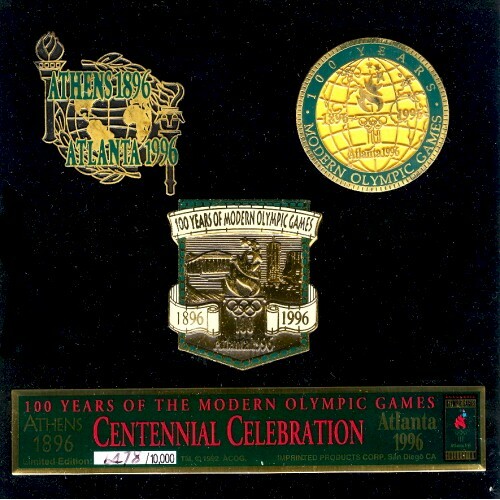 1996 Atlanta Centennial Celebration. Click image. New York 2012 fantasy bid pin, gold, backstamp, tack back. My Internal pin collection page 1. Click image for larger picture. 1996 Atlanta Summer Games Official Report. Click on picture for important details. 1996 Atlanta Participant’s Medal . Picture 1 - Obverse, Picture 2 - Reverse. Click image. My Media collection page 1. Click image for larger picture. Atlanta 1996, Nikkan, Japan media. Japanese backstamp.